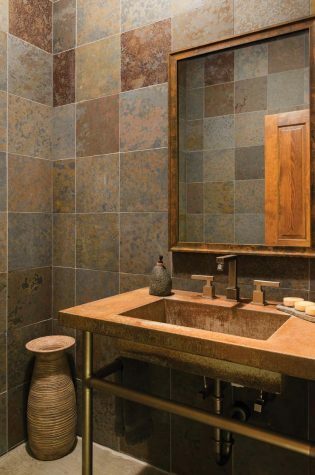 Tracy sketched out the shape of the chiseled stone backsplash in the owners’ bathroom, which was inspired by the mountains. Cabinet knobs are made from rocks. 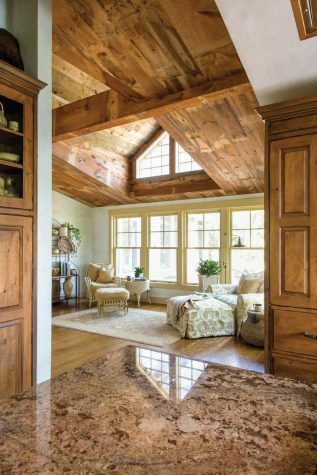 The sitting room, where the couple reads at night, has a vaulted ceiling made of reclaimed barn wood from Pennsylvania. To maximize views from three sides in the owners’ bedroom, Tracy and Eric opted out of window treatments. For the downstairs powder room, Stringer found a concrete sink at Portland Architectural Salvage and added metal legs from a plumbing supply store. The wall tile is Brazilian slate. 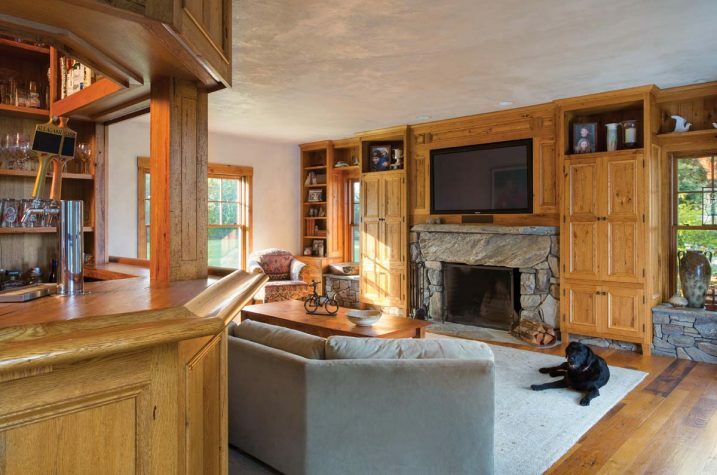 A family room and built-in bar is where the family plays games and watches TV (most recently, a Game of Thrones marathon initiated by Ben and Emily); antique chestnut built-ins surround the fireplace, which is made of local ledge rock. Eric and Tracy knew they wanted to be on the water but had little boating experience: “We bought a boat and kind of were just winging it at first,” says Eric. Today, the couple enjoys paddle boarding and kayaking. In the family room, a massive sectional upholstered in durable Ultrasuede has enough room for everyone to settle in. “It’s been around forever,” says Tracy, “but it’s been so good to us over the years. It’s probably moved 10 times with us.” Above it hangs a portrait of Eric when he played for the Chicago Blackhawks by artist Samantha Wendell. 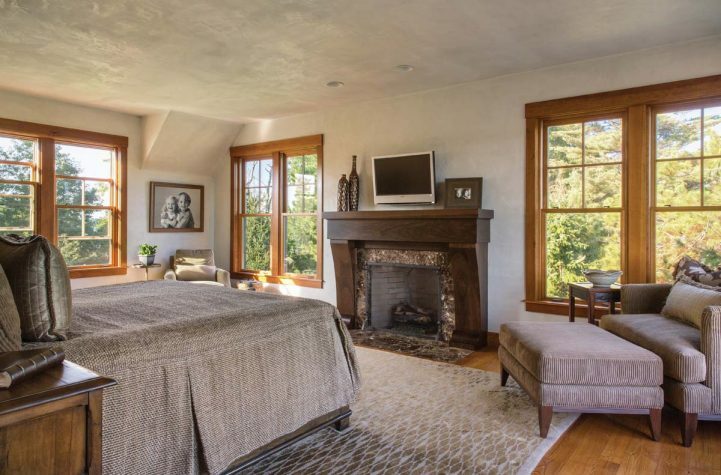 A guest bedroom features a wrought-iron bed, area rug from Mougalian, a pine dresser from Lorts, and artwork by David DeRan and Linden Frederick. Like many professional athletes, Eric Weinrich can trace his love for the sport back to childhood. He started playing organized hockey when he was eight years old, on a frozen pond in Poland, Maine. When his family moved to Gardiner (“It was closer to the big rink in Hallowell,” he says), he would travel an hour each way to North Yarmouth Academy, where he played throughout junior high and high school. He played college hockey at the University of Maine, where he studied archaeology and anthropology, and then went on to play in the NHL for nearly 20 years. Having played for eight teams in over 18 years, Weinrich and his wife, Tracy, have a long list of places they’ve called home, although none have had the same pull as Maine. In 2006 Eric announced his retirement from the NHL and moved back to his home state to become an assistant coach for the Portland Pirates. (A few months later, he was back on the ice, playing two seasons with the Pirates before hanging up his skates for good.) “It was hard for him to retire, but with our daughter in fifth grade and our son in seventh, it was getting to a crucial time for them where we couldn’t move every few years,” says Tracy. When it came time to assemble the remodeling team, the Weinrichs didn’t have to look far. 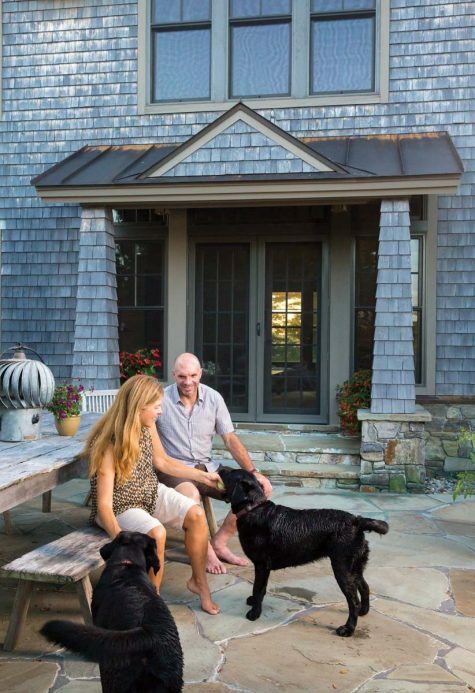 Eric’s father, John Weinrich, is a semi-retired architect in Newcastle, and Tracy’s sister, Denise Stringer, is an interior designer based in Hilton Head, South Carolina. The couple also worked with Peter Warren of Warren Construction Group in nearby Freeport, whom Eric’s brother Jason Weinrich worked for as a carpenter. “It was a real collaboration,” says Warren. The team got to work updating and repairing the original Cape with a new roof and windows. “That point of land gets a tremendous amount of wind, so there were a lot of challenges with the existing structure that came up during construction,” says Warren. Then came the new parts of the house: expanding the kitchen and adding a mudroom, sitting room, powder room, family room, exercise area, and owners’ suite above. 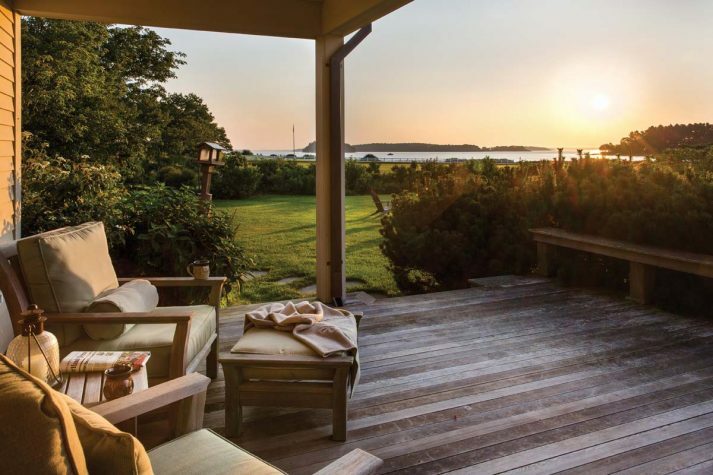 Maintaining the charm of the existing Cape while adding living space on a limited footprint was architect John Weinrich’s goal—all “while not creating an ostentatious, out-of-scale structure that could have been disrespectful to the island’s style,” he says. As a result of a limited building area due to zoning setback requirements, Weinrich designed a barnlike structure attached to the existing center-chimney Cape. “The traditional clapboard-cladded Cape and wood- shingled barn structure was an obvious seamless fit on the coastal island,” he says. 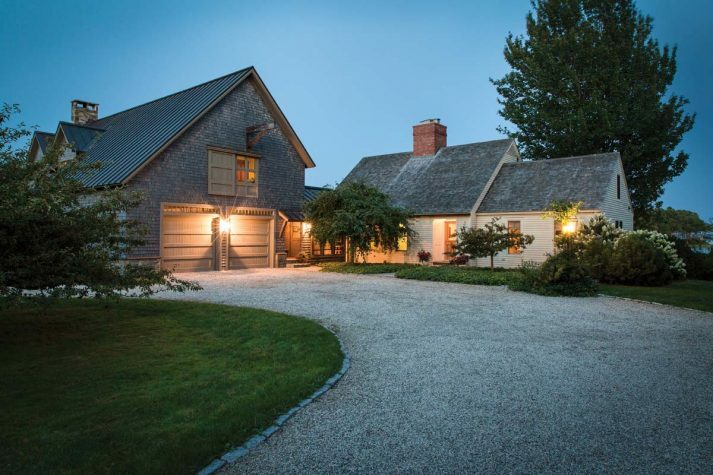 The addition is situated to the left of the original Cape’s front door and is connected via a mudroom entry. “We have always loved old farmhouses,” says Tracy, “and this gave us our version of an ell.” The mudroom leads into an expanded kitchen with cabinetry that resembles furniture and an oversized island by Phi Home Designs of Rockport. 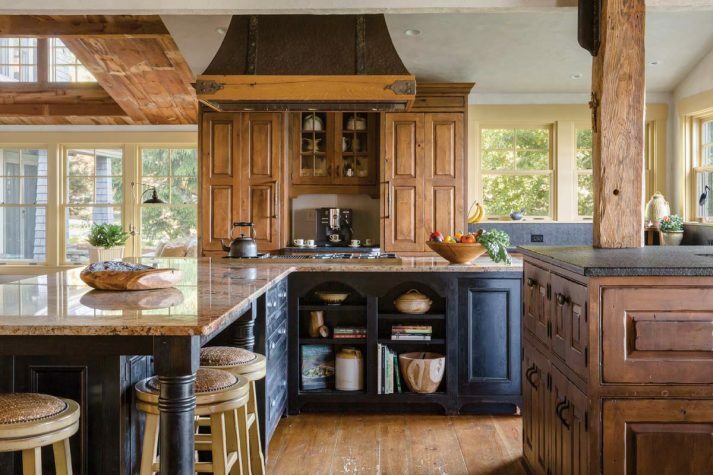 Kitchen designer Robin Amorello of Atmoscaper Design in Topsham helped with the layout. The Weinrichs cook a lot, and over the years the island has become the main gathering spot for family dinners. “We’ve got a small garden out there, and we love to use our fresh produce when we can,” says Tracy. 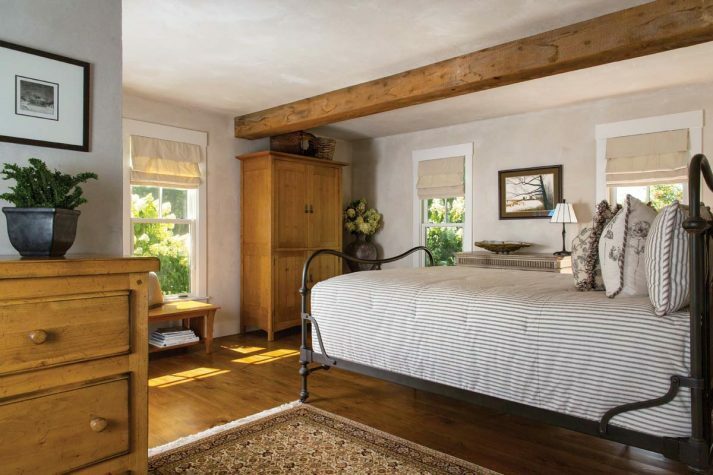 The original center-chimney Cape still includes the dining and living rooms, complete with their original fireplaces and wooden ceiling beams that were reclaimed from a local barn at the time of construction. 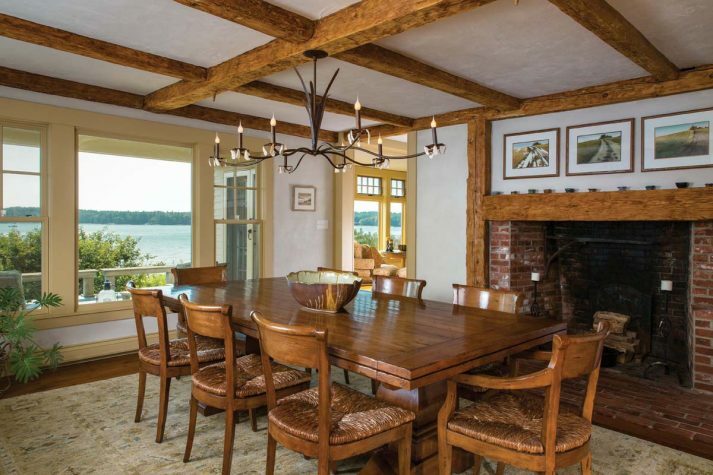 The beams had been stained “almost a burgundy color,” according to Tracy, so the team worked with Tony Castro and Company of New Gloucester to restore them to their natural glory. The main living areas still have their original pine floors, some of the planks 10 inches wide. A bedroom suite on the first floor that was originally the owners’ bedroom is now a guestroom. Upstairs, the team added a dormer on one side so that each bedroom has its own bath and closet space. This is where Ben and Emily stay when they’re home from college and where extended family members stay when they visit. Creating a seamless flow between the old and new parts of the house was a key part of Stringer’s role, as well as Warren’s. “There were some complicated finishes,” says Warren, “but that’s what we like to do.” Wood, plaster, brick, stone materials, and wooden built-in casework design elements were extrapolated from the interior details of the original house and carried through portions of the new construction, such as the existing barn beams, antique brick fireplaces, wide-plank old-pine floors, and sanded plaster walls that were expertly matched in the addition by Randy Lane Custom Plaster. “They have a very earthy, natural feel and coloration to them,” says Stringer (they’ve also been forgiving to a family with kids, according to Tracy). 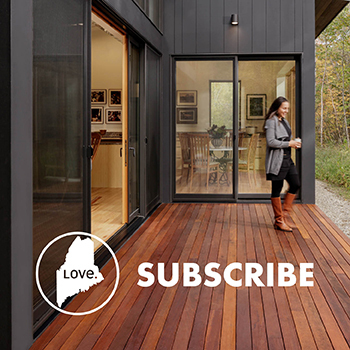 The use of natural materials throughout the addition helped continue the flow of the Cape charm. Bluestone floors, reclaimed chestnut flooring, antique concrete sinks, custom metal light fixtures, local bedrock slabs, and stones for the family room fireplace and built-ins helped in the smooth transition. 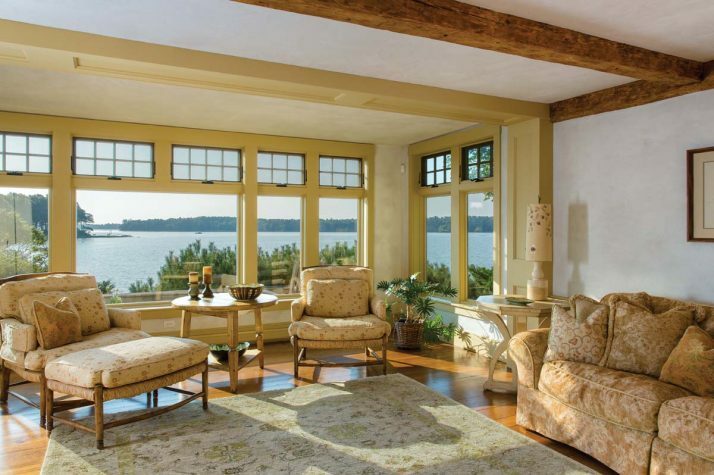 Stringer’s vision for the interior design was also driven by Tracy and Eric’s request to make sure what is inside won’t distract from the ocean views outside, but rather “create a soothing backdrop for the ever-changing, natural picture show outside their windows,” says the designer. Downstairs, adjacent to the kitchen, is a new sitting area with vaulted wood ceiling. “Eric’s dad made a model so that I could understand the difference in ceiling heights,” says Tracy. “The ceilings were pretty low in the original house,” says Eric, “so we wanted the opportunity to do something different here.” At first the couple was worried the angular ceiling would feel too contemporary, but the reclaimed barn wood (this time from Pennsylvania) used in the ceiling creates warmth and beautifully merges the old part of the house with the new. 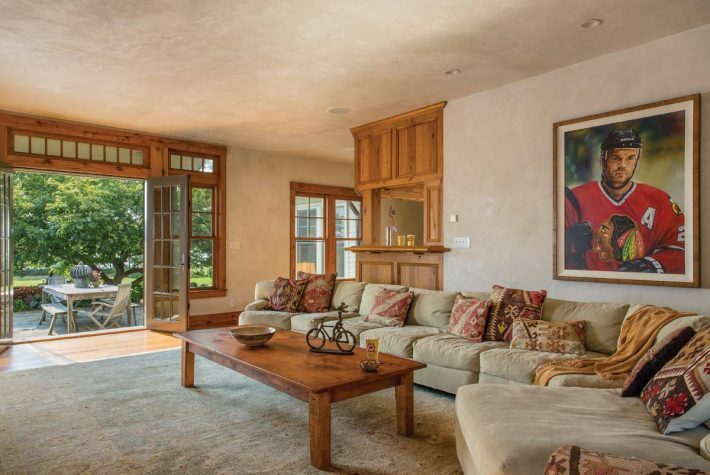 Beyond the sitting area is a hall leading to the family room and built-in bar where the Weinrichs play games and watch TV. Upstairs in the addition is the new owners’ suite, with water views on all sides. “We decided against window treatments,” says Tracy. 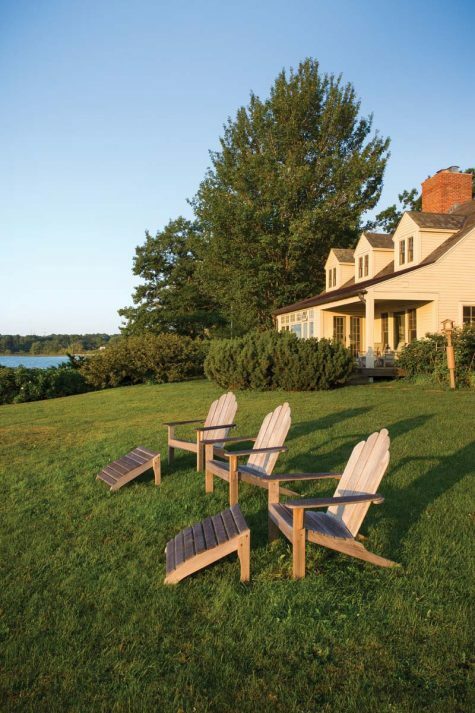 “We just don’t need them here.” Here, as elsewhere in the house, Stringer kept the palette neutral to let the views and natural materials— wooden beams, built-ins, and fieldstone floors—shine. These days, the house that’s served as a long-awaited home base for their family is a little bit emptier. Ben is in art school in Baltimore, and Emily is on a semester abroad in London. Eric is a player-development coach for the New Jersey Devils, and Tracy works in the Yarmouth middle school library. “Today the house is a little bit quieter and feels bigger than it used to,” admits Tracy. 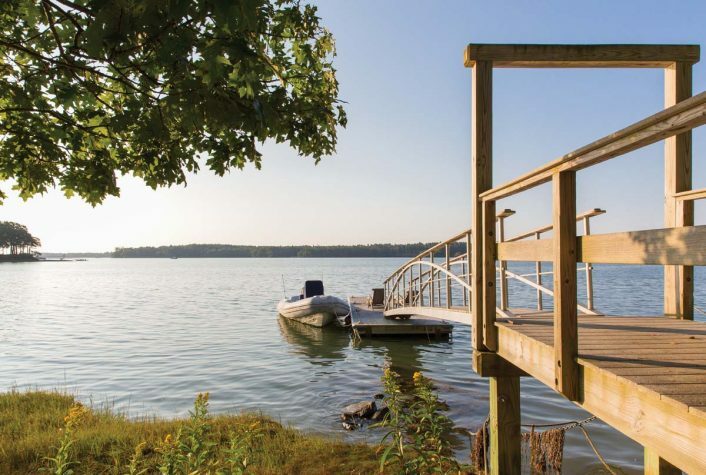 “But I still want the space for when the kids come home—and for grandkids someday.” After decades of moving around, the Weinrichs are finally anchored to Maine.